Sorry everyone for publishing two posts today, you know I don't like to overload your google readers, but this really needed a post of its own. The fabulous Trish from Trish's Reading Nook has set up this brilliant challenge to help us all get fitter and slimmer for Christmas. The aim is to 'travel' 100 miles between now and December 31st. I just couldn't resist joining in and will also be contributing a few helpful hints and recipes on the challenge site too. Here’s how it works:In order to complete this Challenge, you will need to “travel” 100 miles from October 1st through December 31st. Here's how you calculate your mileage:*Running or walking 1 mile outside or on a treadmill equals 1 mile. *15 minutes of other workouts equals 1 mile (elliptical, swimming, weight lifting, workout video, workout classes, etc.). A few "workout" stipulations:“Workouts” only include activities specifically done for the purpose of exercise. Shopping, house cleaning, walking to and from the parking lot, and other day to day activities should not be included. Partial miles travelled on different days cannot be combined. For example, if you run 1.25 miles on one day, and .75 mile on another day, that does not equal 2 miles. It counts as 1 mile.Minutes accumulated on two different days cannot be combined. For example, if you workout 10 minutes one day and 5 minutes the next day, that does not combine to equal a mile. 1 mile on the bike does not equal 1 mile, etc. Only walking/running is mile for mile. Otherwise it would be too easy, huh? I know this started on October 1st, but you can still join in. 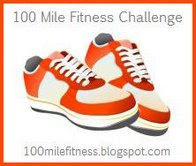 If you would like to join us on this 100 Mile Fitness Challenge, then click on the picture above. Over the last two days I have already achieved six miles by riding my bike for 45 minutes each day. I am going to put up a little counter in my side bar, so that I can keep tabs on the miles I achieve. So come on everyone, get your walking shoes out and get walking. Good luck with that challenge Vivienne. When Trish announced this, I got all excited and went in search of my pedometer. But I think I must have thrown it out. (It annoyed me because it didn't work very well...I knew it was totally off, so I compared the distance with the car...turned out the dang thing was only clocking about a third to a half of all steps.) Would like to get another one and still join in! Just the kind of motivation I need! Good luck, Vivienne! Sounds like you're off to a great start!!! Debi - I must recommend the Weight Watchers pedometer. It is fabulous and gives you so much more information. Good luck with the challenge! You can do it! Good Luck Vivienne! That is the cutes button. I want to join just by looking at it. Thank you ladies for all your support. I have just cycled for another 45 minutes, so now up to nine miles. Good luck with the challenge! I really want to join this one but I pulled some ab muscles last week and it's really brought my workout schedule to a halt. I'm trying to talk my husband into getting me a treadmill because even with pulled abs I can still walk at a slow pace without it hurting too much. So if I do get a treadmill soon enough I might join in on this one. Good luck with your challenge. I am so unfit its becoming embarrassing :-( but in my defense, I use my bike to work every single day of the week, come rain or shine. Thing is, I only have five minutes to work from where I live. LOL. Anyway, I could begin walking I guess, it would take around 20 minutes. Might be an idea. Thanks for the comment on my post about buying books :-) Don't feel bad...I've enjoyed your recommendations so much, that I am actually rather thankful :-) But I AM totally addicted to book buying. Totally. Oh Vivienne--I am grinning from ear to ear (and maybe blushing a little). I'm so thrilled that you'll be joining in on the challenge (and helping contribute) AND that you already have 9 miles!! Way to go! I'm going to join up, too.